Slick (Self-Portrait) (1977). 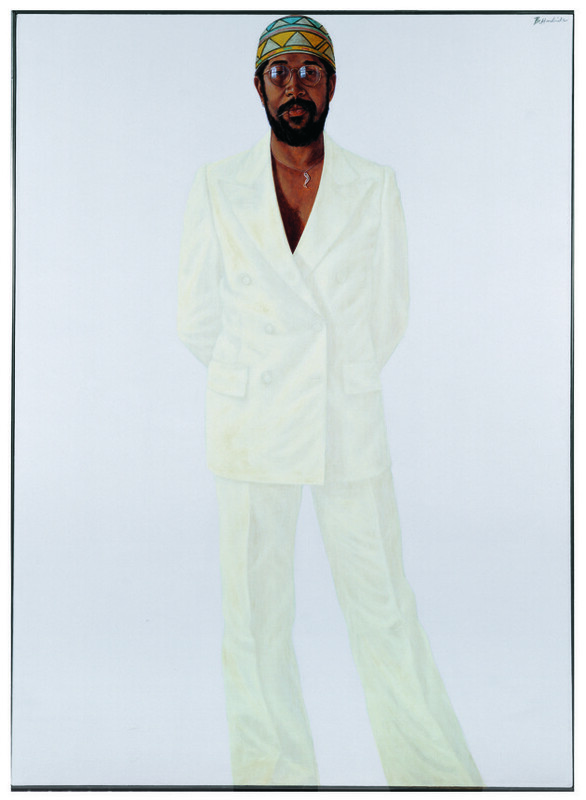 Barkley Hendricks. I arrived at college as a sheltered, shy, nerdy suburban girl. I had never kissed a boy or a girl; I had never drank alcohol; I knew next to nothing about the world. I may as well been 12 years old. I liked to draw and paint and wanted to be an artist but really didn’t know what that meant — other than my parents had forbidden this calling. Soon after arriving, I was introduced to my advisor, Barkley Hendricks. Back then a student never called an instructor by their first name. He was Mr. Hendricks to his face, and Hendricks behind his back. This is how we referred to all our instructors — by last name only. Hendricks was very imposing to me. He seemed very sophisticated. To my 18-year-old mind, he was already old. It’s funny to think now that he was only in his 34 when I met him, and that he had gotten his position at my college right out of graduate school. He reviewed my drawings, which I was very proud of, and said I had potential. I know now that I had good skills but no real sense creativity or expression. Back then I was disappointed that he wasn’t more impressed with my work. Everyone had always complimented my art and it was the first time someone was not gushing over it. He wasn’t unkind, but the exchanged intimidated the hell out of me. Still, I wanted to learn from him. When I saw his art, it blew me away. I wanted to paint liked he painted. His huge, beautiful painting of people — I’d never seen anything like them. Once about ten years ago, I was in a bookstore and saw a book on the shelf with his name on it, The Birth of Cool. It was kind of amazing to see it and think well, that man is finally getting his due. A little over a week ago, my friend C. was at the Yale art museum and sent me a photo she took of one of his paintings there. I wrote her back, I’d know that style anywhere. It still impressed me, and I felt a nostalgia for the time when I thought I could live a life like Hendricks: the life of an artist. A few days later I found out that he had suddenly passed away, and I was stunned. There’s so many things I didn’t realize when I was a freshman. Mainly, that it was highly unusual to have a Black artist as my advisor in this cozy little New England college. The fact that he had already made a name for himself was even more unusual, but it was only in recent years that I really thought about these things. I also didn’t realize for years what a huge influence he was on my art. His human-scale figures inspired me to do the same. A lot of my early post-college work is really one big homage to him, but I was unconscious about it for a long time. It pains me now that I never circled back and thanked him for what he gave me, which was so much: believing that I could live a life as artist (even if I didn’t end up doing that), believing I could make art that would give me the thrill that his art did, believing that I should make the art I wanted to make and not concern myself with fashion or trends. I strongly believe his presence as an artist will only grow over time. Even though I will never be able to say it to him in this life, I still want to say: Mr. Hendricks, thank you.